The telephone rang last evening about 5:30pm. It is hard working from home – our business line and personal line are one and the same. We really need to set boundaries about business calls after hours, but working for ourselves has turned us into a 24/7 business. The caller ID identified the person as “Marilyn Monroe”. I was certainly intrigued. Was Marilyn back from the dead and actually calling me?! No such luck. The woman was the daughter of a new client we met last week. We spent hours researching, photographing and listing 25 items for this client from Sunday until Thursday. Each night I sent a link to the client’s two daughters (she doesn’t have email), so they could follow the auctions. This is a courtesy I extend to all our clients and it is part of our complete service as eBay Trading Assistants. The woman (whose first name is NOT Marilyn and whose last name is NOT Monroe) was upset at the opening bids I placed on her mother’s auctions. I have been selling on eBay for 10 years, and I know what I’m doing. The opening bids were correct for those items. I explained how I work with each new client and I am very clear that the client needs to tell me if they have a specific price goal in mind for any items. If I don’t think their price expectations are realistic, I let them know BEFORE I list anything or sometimes, I don’t even bother to take those items. This client understood how eBay works – she used a different eBay Trading Assistant a few years back. I left her mother’s house with the understanding that I would start the auctions where I thought they should be started. She did not object. Now, 4 days into the process, the client’s daughter is calling me. She told me the starting bids were all too low. I explained that given the condition and category of each item, I felt the starting bids were right, but I would be willing to change any opening bids on auctions that had no bids. She told me she would have to speak to her mother and get back to me. Either she was going to bid on the items herself or she wanted to raise the opening bids. I told her that we did not condone shill bidding and if she won the auctions, we would still be charging her the eBay fees and our commission. About 1/2 hour later, the phone rang. It was Marilyn Monroe again. Supper was cooking on the stove and my food timer had 4 minutes to go. MM told me she wanted to change the opening bid on ALL the auctions. I told, OK, but it is dinner time and my food was almost ready. Could I call her back in 15-20 minutes? NO. She told me that if I didn’t immediately go to the computer to make the changes she requested, she would hold me personally liable if any items got bids in the next 15 minutes. Seriously? I again told her that it was dinner time. I then hung up. I know. 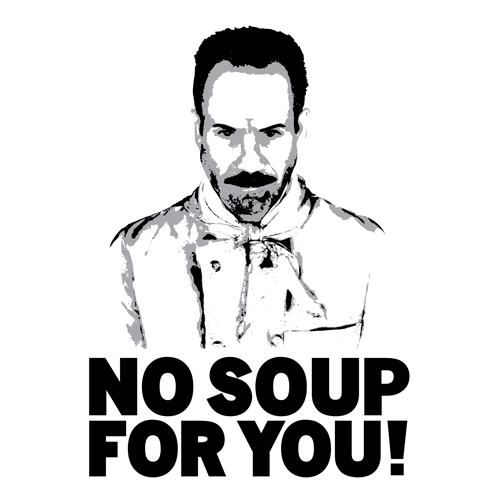 I shouldn’t have hung up – but who was she, the famous Seinfeld Soup Nazi – “No soup for you”. How dare she tell me that I should leave my dinner and go to work for her immediately. I then told Richie that I wasn’t dealing with this nut job. He called her back and told her that we wouldn’t deal with her and that she should pick up her mother’s items. We spent 1/2 hour de-listing all 25 auctions, some of which already had bids. We were in the process of negotiating with someone on one item as well. Now we were left to deal with angry bidders! She and her mother came by today to pick up their items. Richie told her about the sale we were about to make on one item and can you believe this (of course you can), the daughter asked us for the name of our buyer so that she could make the sale. We work on commission – or did she forget? No, we didn’t give her our contact information. Selling on eBay is a tough business. Selling for 3rd parties adds one more degree of difficulty. Not only do we have to please the buyers, we have to please our clients as well. We work hard to make everyone happy and try to earn our living at this at the same time. In this case, we lost a week’s worth of income and left some bidders angry at us for canceling auctions. All I have to say to Miss Monroe is, why don’t you and your mother go out and get a bowl of soup – I’m sure the Soup Nazi must be a personal friend and wouldn’t mind letting you eat YOUR dinner. He might even put your autographed photo on his restaurant wall, Marilyn. This is just another example of our declining “Me” society —NO MANNERS Or Consideration for the other person. People should realize working out of your home does not make it any less a “business.” All businesses allow their employees breaks and meal times. You and Richie are experts in your field and clients should know you research their items before placing a starting bid. Do people know that trends are constantly changing and just because an item is worth big dollars a few years ago does not make it worth the same today. Thank goodness NOT all your clients are like Marilyn Monroe… Some of us appreciate you and know how very hard you work. Cor we know all about when people ring you at random times. We also work from home on eBay and because our business is international we have had people ring us at 4am on the landline wanting blooming ebay store design for their ebay shops. You can probably guess my reaction at that time in the morning lol.